← Dining Out and Obesity: Related? We eat a lot of spaghetti sauce at the Parker Compound. We make enough for leftovers at subsequent meals. Many folks with diabetes get unacceptable blood sugar spikes when they eat typical wheat-based spaghetti or other pastas. 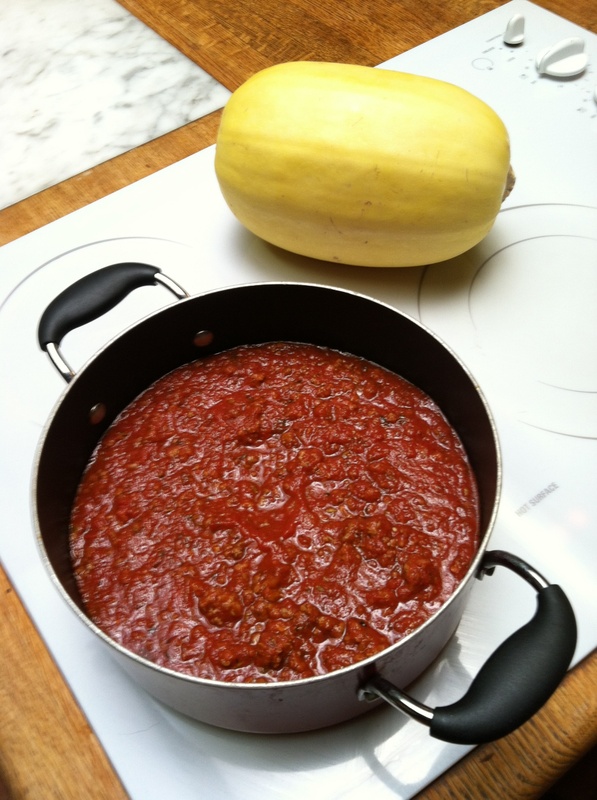 Avoid that with a spaghetti substitute called spaghetti squash (click for the recipe and nutritional analysis). This recipe uses Truvia, a sweetener that’s a combination of stevia and erythritol. If you don’t have any, don’t fret: you have options. Stevia is supposedly “natural.” I don’t know where erythritol, a sugar alcohol, comes from. The purpose of a sweetener is to counteract the tartness or bitterness of the tomatoes. Honey would probably serve this purpose, but I’ve never tried it in this recipe. If you use the honey or table sugar option below, it will increase the digestible carb count in each cup by three grams. Whatever your favorite non-caloric sweetener, use the equivalent of two tablespoons of table sugar (sucrose). To avoid carbohydrate toxicity—high blood sugar—eat this over spaghetti squash rather than pasta. I’ll have a post on cooking spaghetti squash soon. Small or inactive folks may find a half cup of sauce over one cup of cooked squash is a reasonable serving (about 250 calories). I prefer to double those portions, making it a whole meal. I’m flabbergasted – I live in Italy (though not Italian) and often make ragu for various uses, not only for pasta, and have never yet added sugar to it other than in the form of a slug of wine. Marcella Hazan doesn’t use sugar in her meat sauce either – and when it comes to Italian recipes she knows what she’s talking about. Just cook it longer to remove any bitterness. Not that I have ever noticed any when the tomatoes are properly ripe and that’s why you use tinned ones. Though I would suggest maybe you are using too much tomato paste. Thanks for those tips, Eileen.